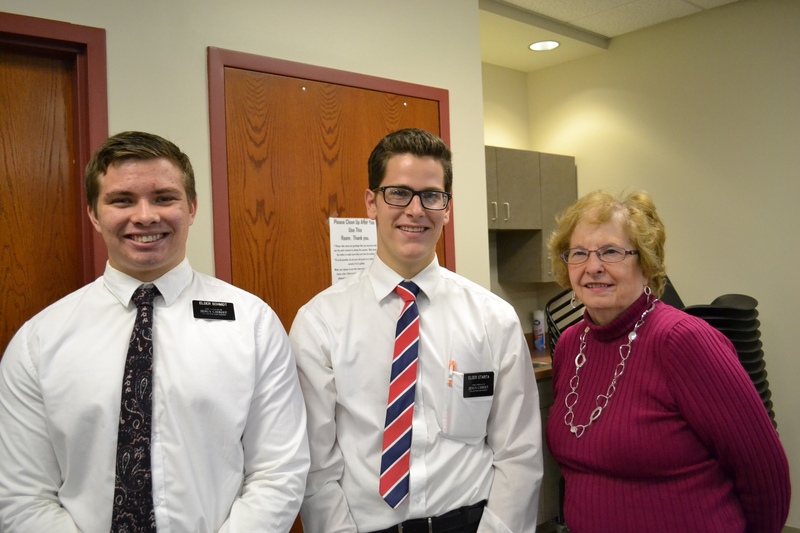 Elder Ethan Schmidt and Elder Micah Starita from the Church of Jesus Christ of Latter-day Saints in Jonesville orga­nized a free family history seminar at Hillsdale’s Public Library on Oct. 2. With the assis­tance of Dorothy Perry, a director for family history at the same church, they assisted those who were new to genealogical searching or already expe­ri­enced and wanted to expand their own family tree. The seminar pro­vided brochures, packets, and pow­er­point slides about using FamilySearch.org. Perry said this website, which requires users to make a free account, allows people to update, pre­serve, and learn more about their family history. Members can input family doc­u­ments, photos, and audio recordings. While teaching at Hallmark Uni­versity, Perry said she assigned a genealogy project to her stu­dents using this website and one of them dis­covered that he was related to Perry’s husband. Elder Schmidt said while growing up he found genealogy searching boring, but now he enjoys the process ever since he arrived in Jonesville for mission work. He even shared a story of his great-grandpa trav­eling to Scotland for his mission and finding a lover there. Elder Schmidt said his grandpa’s family didn’t approve of his girl­friend, but his grand­father saved enough money, sailed back to Scotland, married her, and brought her back to the U.S.
Elder Starita is a family history librarian who helps people start exploring and recording their family history and said the whole pro­cedure is like a puzzle. Elder Starita even helped his adopted sister from China use the website to find her direct parents. Many members from the Church of Jesus Christ of Latter-Day Saints use the website, Elder Starita said. “We all have this massive her­itage,” Perry said. In addition to its free mem­bership, Perry said FamilySearch.org includes mini games, such as jeopardy, testing how well members know their family tree. “Once you get a family tree in, it’ll create a jeopardy game from it,” Perry said. Elder Schmidt said the website also has an app people can access on their phones. “You can click on ‘Rel­a­tives Around Me’ and it’ll scan his phone and scan our trees and say we’re 13th cousins,” Elder Schmidt said. Edler Starita and Elder Schmidt said since it is their first time having this seminar at Hillsdale’s public library, they plan on having another one in a couple of months and host a family research gath­ering every second and fourth Sundays of each month at Jonesville’s Church of Jesus Christ of Latter-day Saints. Anyone inter­ested in gaining more access to local family records is welcome to join.